The abnormally warm February in Europe and NE Asia continues to leave its mark on the global gas markets, having left gas storage levels high and prices floundering. 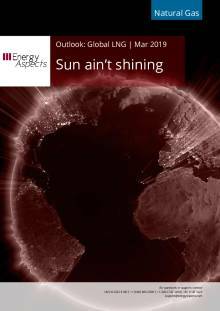 With the weather in March closer to the seasonal average, but still warmer y/y, hearty supply and indifferent demand has meant that..
A comprehensive insight into global LNG market features, from terminals and projects to pricing. If you would like to discuss a custom subscription for your team, please contact us. * Price per issue figures are based on the total number of issues released in a year.